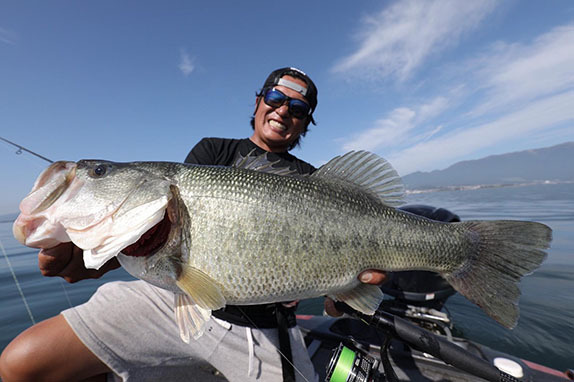 Kenta Kimura, a full-time guide on Lake Biwa and Bassmaster Opens competitor, knows how to unlock the big bass bite in Japan. Japan’s bass-fishing scene has always been mystical. The Japanese Domestic Market (JDM) is a magical world few Americans have been able to experience. The Internet has helped make the bass-fishing world a smaller place, but it has also created plenty of questions. With BassFans having greater access to fishing gear than ever before and access to social media, the Japanese market and its culture has become very appealing. By the mid-1990s, West Coast American pros knew the value of Japanese lures. As word filtered down to regular folk, it encouraged companies to market and sell more Asian products in America. Pristine topwaters and jerkbaits were the first wave of lures to be sold here, but the entire fishing landscape changed once the dropshot arrived. As dropshotting became popular, the demand for specialized tackle grew. Since then, American anglers have become more willing to pay big bucks for reels, rods, line and lures to get an edge on tournament competitors. This summer, while in Japan, I set out to get a sense of the bass-fishing scene and scope out which innovative and unique techniques might be imported to American in the next few seasons. Hideyuki has been on assignment throughout Asia, Europe, and the Americas to inform Lure's readers what’s happening across the globe in fishing. “The most significant different between American and Japanese fisherman is that 80 percent of bass anglers (in Japan) fish from shore. They mostly fish rivers, ponds, canals and small lakes, as Japan doesn’t have a lot of big lakes. Only a very small (number of anglers) own a big bass boat." Without the burden of an expensive bass rig and tow vehicle, Japanese bass enthusiasts are more willing to invest in top-notch gear. Kenta Kimura, a full-time guide on Lake Biwa, has fished and competed in tournaments throughout Japan and the U.S. for decades. Having competed in the 2018 Bassmaster Central Opens, finishing 21st in the Central points and 4th in the Red River event, he has a good read on the bass-fishing scene on both sides of the Pacific Ocean. 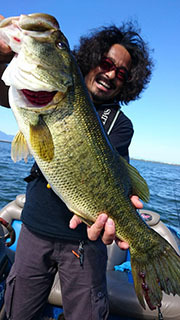 Norura Hideyuki, editor of Lure Magazine, loves to catch bass with big swimbaits. He added that tournament fishing in Japan has been on a decline compared to a decade ago, so most bass anglers don’t concern themselves with filling limits as much as American anglers do. “The bass-fishing scene in Japan is more like California or Texas, where the focus is on big bass. Anglers are not trying to win tournaments. They’re more excited to land a truly big one." Always looking to fool that next big bass, throwing everything from super-finesse offerings to giant swimbaits, Japanese anglers can be much more open-minded. If it’s different and it works, then they’ll buy it regardless of the price. “Down south (in America), bass are focused on shad and in northern waters the yellow perch is a common prey,” said Kimura. “American anglers use baits that look like those types of bait fish. In Japan, we have neither. Insect-inspired topwater baits are super-popular. During the heat of the summer, the cicada chirping can be deafening. Bass readily feast on them or on anything that is eating these insects. Lure companies have taken notice and dozens of cicada-inspired baits hang in tackle stores. Many baits are exact duplicates to these square-nosed insects while others work off a rough outline. Many topwaters incorporate the rounded metal blade of the classic Jitterbug or metal wings of the Heddon Crazy Crawler. Both designs mimic the erratic shimmy of a cicada struggling to stay afloat. The Duo Realis Koshinmushi Cicada Bug and Megabass Grand Siglett are two insect baits that have landed in stores. A more local version is the Lunkerhunt Yappa series – a fine spinoff. Matching the hatch was the catalyst for one of Japan’s most inspiring lure designers Takanori Hiraiwa. 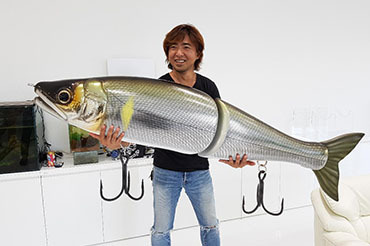 Owner and lead artist for Gan Craft, Hiraiwa’s passion for creating ultra-pristine, jewelry-grade lures, rods and accessories has gained him international recognition and sales in more than 12 countries. Two of the company’s crown jewels are the Jointed Claw and the Kaiten. Takanori Hiraiwa, owner and lead artist at Gan Craft, shows off an oversized version of his Jointed Claw. The Jointed Claw is a segmented hard swimbait that was one of the first to incorporate an exaggerated, yet graceful S-swimming action to glide baits. Custom-paint schemes, aplastic fish tail and two treble hooks adorn this swimbait that has drawn a cult-like following. It’s currently available in six sizes from 115 to 303 millimeters (4.5 to 11.9 inches), three buoyancies and a range of specular colors, plus numerous limited-edition patterns. The Kaiten is a magnum (178-millimeter), one-prop screw bait (spy bait) that is identical in craftmanship and quality to the Jointed Claw. Some credit this bait as being one of the first spy baits ever created. These lures are not cheap – some custom editions fetch hundreds of dollars – but popular art is never inexpensive. For fans, these two baits are the epitome of excellence. Gan Craft embodies the traditional Japanese dedication to craftsmanship and detail that Japanese lure manufactures are famous for. Headquartered in Tanabe City, Wakayama Prefecture (about 70 miles south of Osaka), Hiraiwa and other bass anglers in this region must contend with gin-clear, mountain rivers. Looking more like pristine Rocky Mountain trout rivers than traditional bass waters, it takes an exceptional level of realism to win over the region’s bass. Taking his inspiration from the ayu, a Japanese cold-water river fish similar to a trout that flourishes in these waters, and his passion for catching monster bass, Hiraiwa developed his company. “I have a passion for catching bass with big swimbaits," he said. "Making my lures look exactly like a real ayu was important for me. I really wanted my lures to look and move like a real creature." Gan Craft has developed its product line and fishing brand into a lifestyle that is equal parts urban cool and art, but without losing focus on fishability. Its fresh and saltwater offerings include reels, rods, lures, clothing and accessories – each element of the brand complimenting the company's design. Gan Craft is not the only company making unique baits, but it is one of the largest. There are scores of regional lure companies that have a strong local following. If they’re lucky to catch the eye of a popular angler or be featured in a magazine, they can instantly become hot. Tournament wins are influential in generating lures sales, but they don’t have the sway that they do with American anglers.